The low ropes course challenges the campers. In small groups, they work on communication, collaboration, problem solving, leadership, risk taking, and every element is tied back to their faith and relationship with God. Each element draws upon team members to actively support each other. The low ropes elements are close to the ground so the perceived risk is low, but still challenging to complete. 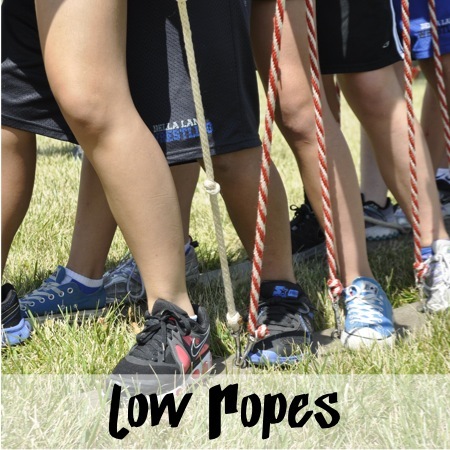 Check out this video from one of the low ropes elements. The goal? Four people jumping at once. Everyone must go through (including the people turning). Every time the rope hit the ground, a group had to go through. Sound hard? Well it’s not as easy as it sounds. It took quite a few tries. So many that the photographer became used to stopping the recording – thus you miss the celebration. But the fact remains, no matter how many tries it took… they did it. And they wouldn’t give up until they did.